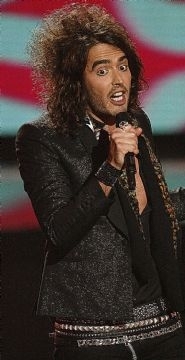 Brand, Russell Brand. My new hero. Those kooky Brits, they’ll say anything! I may have a new candidate. If Obama can’t get his campaign back on track (why the hell are we still talking about Sarah’s glasses??!!) I’m writing in Russell Brand. His routine is peppered with hysterical comedy and the eejits who are incensed, only prove his point. How embarrassing for the US. “But I know America to be a forward thinking country because otherwise why would you have let that retard and cowboy fella be president for eight years? and this shows how he’s putting us on…. It’s all the better because I just watched “Forgetting Sarah Marshall” on the flight home from San Francisco and he plays a character very similar to his persona here.